It is less common in the writing test, but sometimes you will get an IELTS process diagram to describe. Follow this link about how to write a task 1. However, there are different types of task 1 (line graphs, pie charts, maps etc) and each requires knowledge of a certain type of language. This lesson will look at how to write an IELTS process diagram for task 1. What is an IELTS Process Diagram? A process will have a number of stages that are in time order. So you should start at the beginning, and describe each stage through to the last one. In the example above, this is fairly clear. It begins with the digging of the clay, and ends with delivery. Processes are not always this clear, and you may have to look more carefully to spot the beginning, and there may also be two things happening at the same time. So it is important that you look at other sample processes to get a good understanding of how they can vary. 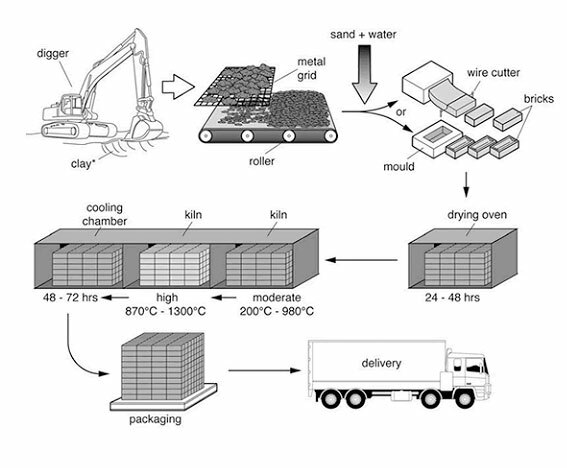 The diagram explains the way in which bricks are made for the building industry. As you can see, this has been taken from the question, but it has not been copied. You need to write it in your own words. An IELTS process diagram is different to a line, bar, pie chart or table in that there are not usually key changes or trends to identify. However, you should still give an overview of what is taking place. The ‘public band descriptors’ state that to achieve a band 6 or more for ‘task response’ the student must provide an overview in a task 1. Overall, there are eight stages in the process, beginning with the digging up of clay and culminating in delivery. These connectors are the same you would use to write a graph over time when you explain a series of changes. ** If you use before, this means that you will be mentioning a later stage before an earlier stage, so you need to use it carefully. If you can use it properly though, it will get noticed. Before being dried in the oven, the mixture is turned into bricks by either placing it into a mould or using a wire cutter. When we describe an IELTS process, the focus is on the activities, NOT the person doing them. When this is the case, we use the passive voice, not the active. This is a brief explanation of how to use the passive voice, but if you are new or unsure about using it, you should do some further study and practice. (S) A large digger (V) digs up (O) the clay in the ground. In the active voice (as above), the digger is doing the verb i.e. the digger is doing the digging. When we use the passive voice, we make the object (the clay) the subject, and make the subject (the digger) the object. We also add in the verb ‘to be’ and the past participle (or Verb 3). (S) The clay in the ground (V) is dug up (O) by the digger. So throughout most of your description for your IELTS process diagram, you should be using the passive voice. ...the bricks go through a heating and cooling process. This is why you need to make sure you practice the passive so you know exactly how to use it. Also, as you will see from the description, it is more usual to to comment on who or what is doing the action so the 'by...." phrase is excluded. To begin, the clay (which is) used to make the bricks is dug up from the ground by a large digger. This clay is then placed onto a metal grid, which is used to break up the clay into smaller pieces. A roller assists in this process. Sometimes it may be appropriate just to use the same language that you are given in the IELTS process diagram to describe it, but you should try to vary it. Follow this link from the model task 1 pages to see a full IELTS process diagram model answer for this process. First of all, letters and packets are collected in bags from pillar boxes, post offices and firms, in post office vans. They are then taken to the sorting office, where the bags are emptied and the letters separated from the packets. Following this step, the letters are put through machines so that the stamps can be cancelled. In this process the date and place of sorting are put over the stamps on each envelope. In the next stage, the sorting of the letters takes place, according to the county they are addressed to. This is done by placing them in the appropriate pigeon hole. Subsequently, the letters are taken from the pigeon holes and placed in baskets, which are then put onto a conveyor belt. While on this conveyor belt, the baskets are directed to the appropriate secondary sorting section by means of coding pegs. At the secondary sorting frames, the letters are put into towns in the county. Later, the letters are tied in bundles and a label is put on showing the towns they are addressed to. Finally, the letter bundles are placed in bags, which have the Post Office seal, Post Office Railway number and Destination Code number on them, and then these are sent to the railway station. Notice that the passive form of the verb is widely used. This is because in this type of writing, we are usually more interested in the process than in the people doing the work. Observe all the link words. The silicon base is first coated with silicon dioxide, which does not conduct electricity, and then with a substance called photoresist. Shining ultraviolet light through a patterned mask hardens the photoresist. The unexposed parts remain soft. A solvent dissolves away the soft unexposed layer of photoresist, revealing a part of the silicon dioxide. This is then chemically etched to reduce its thickness. The hardened photoresist is then dissolved to leave a ridge of dioxide. Layers of polysilicon, which conducts electricity, and photoresist are applied, and then a second masking operation is carried out. The unexposed photoresist is dissolved, and then an etching treatment removes the polysilicon and silicon dioxide beneath it. This reveals two strips of p-type silicon. The hard photoresist is removed. The layers now undergo an operation called doping which transforms the newly revealed strips of p-type silicon into n-type silicon. Layers of silicon dioxide and photoresist are added. Masking and etching creates holes through to the doped silicon and central polysilicon strip. The photoresist is dissolved, and a final masking stage adds three strips of aluminium. These make electrical connections through the holes and complete the transistor. Carbon, the basic element of organic chemistry, undergoes a natural cycle in the environment. It exists in the form of carbon dioxide in the atmosphere. From there it is absorbed by plants to build carbohydrates in green leaves. When plants burn, and animals breathe out, carbon dioxide passes back into the air. Also in decaying plant and animal remains, carbohydrates are broken down to release carbon dioxide into the atmosphere. Static electricity enables a photocopier to produce almost instant copies of documents. At the heart of the machine is a metal drum which is given a negative charge at the beginning of the copying cycle. The optical system then projects an image of the document on the drum. The electric charge disappears where light strikes the metal surface, so only dark parts of the image remain charged. Positively charged particles of toner powder are then applied to the drum. The charged parts of the drum attract the dark powder, which is then transferred to a piece of paper. A heater seals the powder to the paper, and a warm copy of the document emerges from the photocopier. A colour copier works in the same basic way, but scans the document with blue, green and red filters. It then transfers toner to the paper in three layers coloured yellow, magenta and cyan. The three colours overlap to give a full colour picture. Printing is of little use without paper. A sheet of paper is a flattened mesh of interlocking plant fibres, mainly of wood and cotton. Making paper involves reducing a plant to its fibres, and then aligning them and coating the fibres with materials such as glues, pigments and mineral fillers. Trees are felled and then transported to paper mills as logs. The bark has first to be stripped off the logs without damaging the wood. Pulping reduces the wood to a slurry of loose fibres in water. The logs are first sliced into chips and then treated with chemicals in a digester. These dissolve the lignin binding the wood fibres together. Alternatively, machines may grind the logs in water to produce pulp. The pulp is then bleached. The pulp goes to the mixer, where materials are added to improve the quality of the paper. The additives include white fillers such as china clay, size for water-proofing, and coloured pigments. The mixer beats the fibres into a smooth pulp. Liquid pulp is fed from the flowbox onto the mesh belt. Water drains through the holes in the mesh; the drainage is accelerated by suction. The dandy roll presses the fibres together into a wet ribbon known as a web. The damp web moves through the dryer, where it passes between hot cylinders and felt-covered belts that absorb water. It then passes through the calender stacks before being wound on reels or cut into sheets. A domestic refrigerator uses the cooling effect of an evaporating liquid. A refrigerant liquid (such as Freon, a compound of carbon, fluorine and chlorine) is pumped through cooling coils (the evaporator) in which it expands (evaporates) and absorbs heat from the surroundings. The evaporator is formed into the ice-making compartment of the refrigerator. 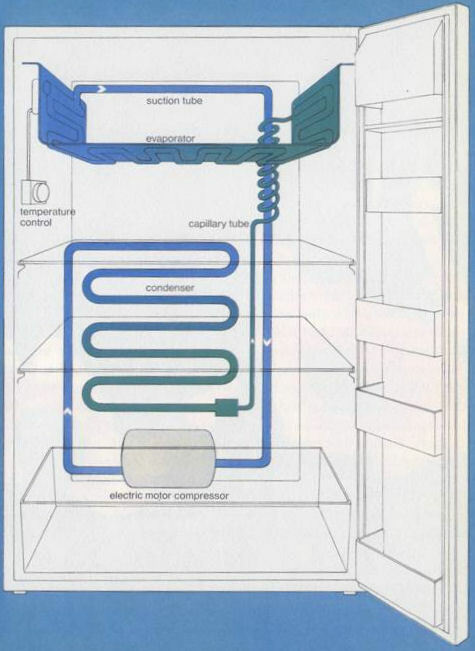 After passing through the cooling coils in the evaporator, the vapour is then compressed by a compressor (usually driven by an electric motor) and condensed back to a liquid when the absorbed heat is given out. The cycle of events is then repeated over and over again. The refrigerator is really a heat engine working in reverse. In order to take heat out of the low-temperature interior of the refrigerator and transfer it to the higher temperature of the surrounding air, work must be done. If it is to work continuously, a refrigerator must be supplied with energy from outside. This external energy is usually electricity, which operates the electric motor driving the compressor, but it could be a gas flame. In the food chamber of a domestic refrigerator the temperature is just above the freezing point of water, about 1° or 2°C: in the ice-maker and in the deep-freeze it is usually around -15°C. A steam engine utilises the energy contained in steam under high pressure. The energy that is released when steam expands is made to produce rotary motion which can be used for the driving of machinery. The steam from the boiler is admitted into the cylinder in which there is a piston and in which the steam expands, causing the piston to move (Fig. la). When the piston has travelled to the end of the cylinder and thus completed its stroke (Fig. lb), the now expanded steam is allowed to escape from the cylinder. 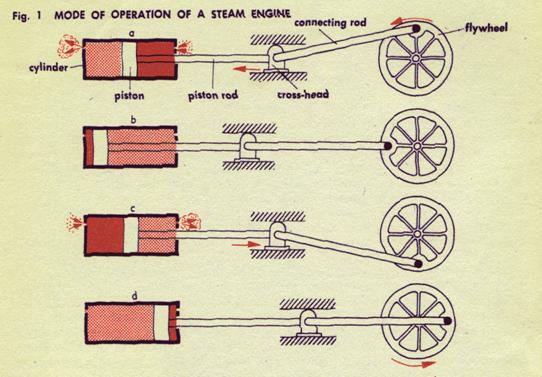 At the same time the steam is changed over, live steam under pressure being admitted to the other side of the piston, causing the latter to travel back, past its starting point (Fig. lc), until it has reached the other end of its stroke (Fig. Id). A steam engine of this kind is called "double-acting" because the force of the steam is applied alternately on two sides of the piston. While the piston is being forced in one direction by the expanding steam, the spent steam is pushed out of the cylinder on the other side of the piston. Reversing, i.e., the change-over of the steam supply so as to ensure the admission of live steam to the appropriate side of the piston and the discharge of the spent steam on the other side, is effected automatically by a control device called a slide valve. 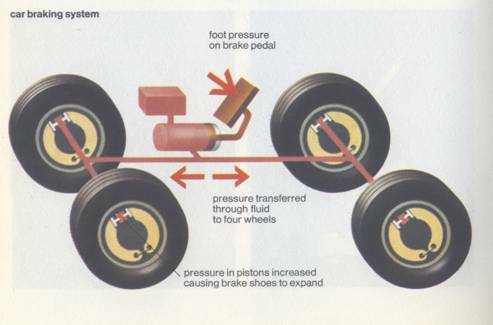 The braking system of a car is a good example of how a hydraulic system works. When the brake pedal is pressed a piston operates which forces brake fluid out of the master cylinder and along four narrow pipes to the slave cylinders attached to the brake drums or discs so that the same pressure is applied to the brakes in each wheel. This brings the car to a smooth halt. Provided the system is kept filled with brake fluid, hydraulic brakes work instantly because liquids cannot be compressed to any great extent. If air leaks into the system, the brakes become much less efficient. This is because, unlike liquids, gases are compressible and some of the movement of the brake pedal is taken up in squeezing the air bubble.